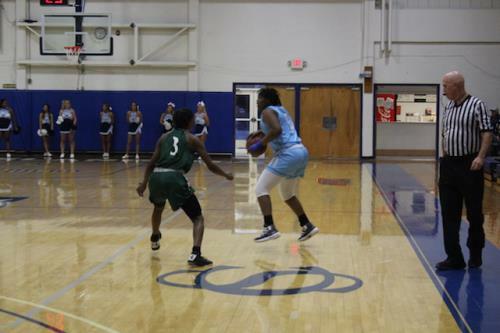 Cleveland State Community College women's basketball team rang in the new year with a matchup against Massasoit Community College Monday evening. Massasoit Community College, based in Brockton, Massachusetts traveled down to Cleveland, TN ranked #1 in the NJCAA with a perfect 13-0 record to accompany it. The Lady Cougars played hard and smart, cruising to victory versus the Lady Warriors, handing them their first loss of the season. Leading the Lady Cougars was Jordan Smith who dropped 25 points, 5 rebounds and 6 assists. Kayla Benefield also had a nice game, scoring 21 points, 6 rebounds, and 9 assists. Britnay Gore tallied 14 points and 12 rebounds while Hannah Phillips scored 10 points. Massasoit Community College did score the first points of the game and held an early lead but the Lady Cougars came roaring past them, taking the lead in the first quarter and not looking back. Led by Jordan Smith and Kayla Benefield, the Lady Cougars displayed great ball movement and determination in the paint, extending their lead up to 20 points before ultimately winning the matchup with an 83-72 final score. The win puts the Lady Cougars at 4-9 (2-3) on the season. Next up, they'll travel down the road to Chattanooga State Community College for a road matchup at 2:00 PM on January 12th.